The first part of St Paul’s church was built during 1790-1791 and was officially consecrated on the 9th of July 1791. There had been a chapel on the same site, but it had fallen into disrepair and the building was being used by a blacksmith. In fact, it is thought that the painting by the well-known artist Joseph Wright entitled “The Blacksmith’s Shop” is based on what he found on a visit to Little Eaton in 1771. In the 1780s serious discussions were started among the community (which at that time numbered around 250) about building a church, and it was decided appeal for public subscriptions. A small rectangular church was built, covering just the nave of the present building, and without a tower. The altar was situated where there is now a step up into the chancel, in front of a curved apse. The round window high up at the back of the church was included to give light to the gallery above the door where the choir and musicians sat. Near the entrance is the Font, where children are baptised in a service where parents and godparents make promises to God on their child’s behalf, to teach the child the truth about the love and grace of God. They and the rest of the church family also promise to pray that the child will grow up to understand the gospel and accept it for themselves. It is believed that the font dates from 1790s. The first memorial on the right hand wall is the Radford family monument, and it was Francis Radford of Elms Farm who gave a generous subscription of £120.00 to the church building project. He and his family were the foremost subscribers and the Rev Robert Wilmot stated that the church ‘was built under the indefatigable zeal and conduct of Mr Francis Radford’. The pulpit and the lectern Bible signify that the teaching of the truths of the Bible is the most important part of a minister’s work, even if it is now done in a more informal manner. Explaining what a passage means and helping the congregation to apply it to their lives is crucial. As individuals and a congregation we constantly need to be challenged, to learn new lessons and to be shown how we can help to spread the good news. The pulpit was added in 1880, with the choir stalls. 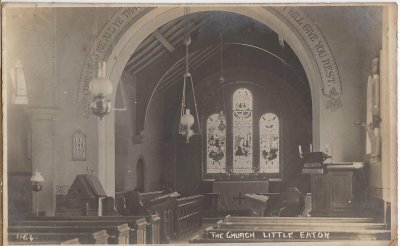 In 1851 the chancel (the front of church) was built, and the floor was raised in 1880 when a new communion table and the choir stalls were added. The stained glass windows in the chancel were paid for by the Tempest family who by the 1850s had turned Peckwash Mill into what was said to be the largest paper making factory in the country. The central window shows Christ on the cross, where he took the punishment for our sins on himself and died in our place. Although we didn’t deserve to be rescued, God sacrificed his own sinless Son so that we might be forgiven. The grace of God and the death and resurrection of Christ is remembered with thanks each time we come to the communion table to take communion. 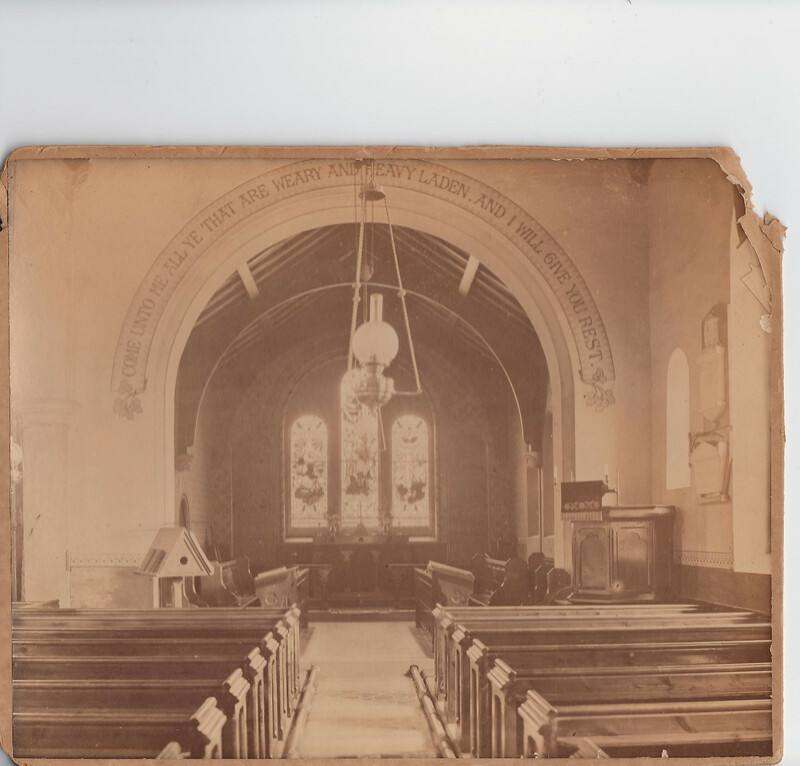 1880 also saw a new archway installed to house an organ, which serves to remind us that within any church praising God through music is an important part of our services, and we have much to thank and praise him for. The organ was finally installed in 1905. The north aisle was added to the church in 1868 which was when the nave roof was raised and the whole body of the church reroofed. On the gallery can be seen the Royal Arms, and at the west end of the north aisle can be seen two tablets either side of the window which contain the Ten Commandments. These serve to show us how far we fall short of God’s standards even when we try our best, and help us to realise how much we need to stop struggling in our own strength and allow Him to reach down and rescue us. The church tower was added in 1851. It houses a single bell (1890) which is still chimed. The porch below it forms a welcoming entrance, and you are warmly invited to come and join us in our services, continuing the faithful witness and following in the footsteps of worshippers who have been in this place for over 300 years. 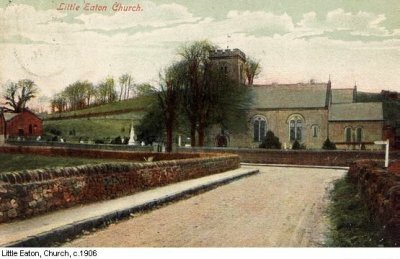 You can find more information about the Church and village history by visiting the website of Little Eaton Local History Society, LELHS.org.uk. 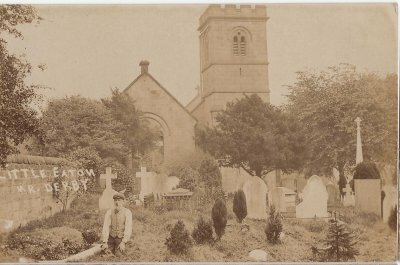 You can also find out more information about some Little Eaton Parish records from Ancestral Archives of Derbyshire, www.ancestralarchivesofderbyshire.com.